It leads me to wonder what the Hyborian Age would look like using different projections (not to mention a Hyborian globe...) The Vilayet Sea would would veer off in a northeasterly angle, while the Pictish coast would curve northwesterly; the coast of Vanaheim would be located right in the centre of what is now Iceland, and its northern coast would graze Greenland; the general proportions of all the kingdoms would be squished about. It'd be an interesting experiment. 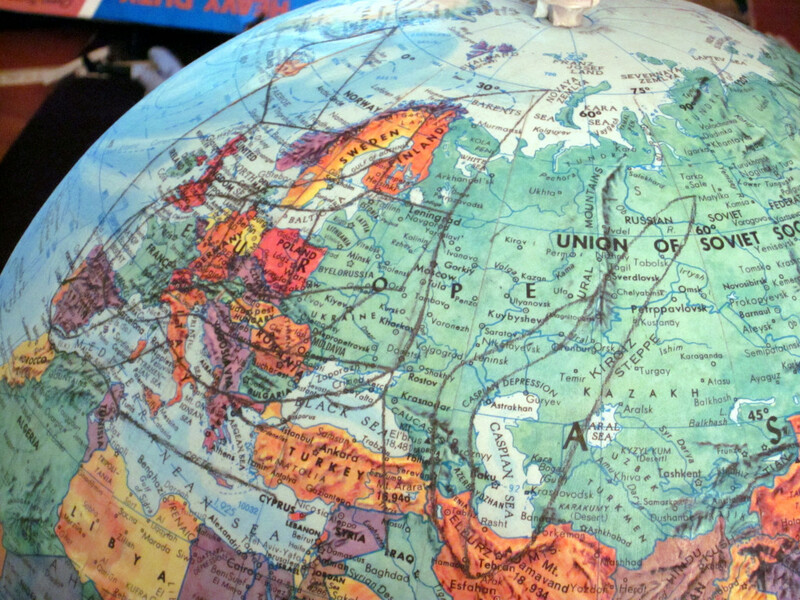 Accounting for these changes in geography and national boundaries would be sidestepped if we assume Howard was simply changing his mind over time. Prosaic and logical, but that's just no fun. Wouldn't it be fun to imagine that, just as Howard's idea of the Conan stories and Hyborian Age evolved over time, so this could be followed in terms of Hyborian cartography? 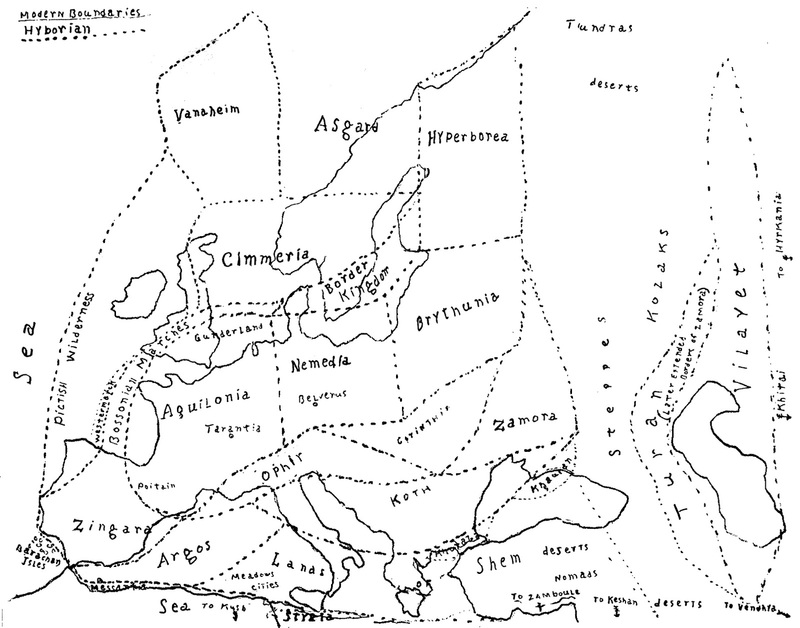 Perhaps these maps could represent the Hyborian Age at different times - Zingara and Argos' borders could be explained by the two countries' long feud, Koth's shifting mass might be a result of the nation's imperial ambitions, Southern Argos and the west coast of Pictland could have sunken under the sea in a minor cataclysm, and so on. Alternatively, they could be explained by different maps by different cartographers. I had indeed pondered the idea of the contradictions of "The Hyborian Age" essay and the published stories not being discussed as Howard altering his history, but that's for another post. Another thing to keep in mind is those important elements which are not present on any of the existing maps. The cities of Tarantia, Belverus and Messentia are on at least one of Howard's maps, but not Khemi, Shadizar or Numalia; the Vilayet Sea and River Styx are present, but not the Black, Thunder, Shirki or Tybor rivers; the tundra and deserts east of the Hyborian Kingdoms are noted, but not the Poitanian mountains or Zingaran forest. We can get a pretty fair approximation of those place's locations from close reading of the text, but sometimes there are single-line references. 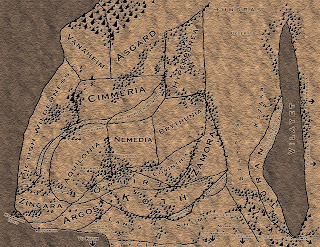 The mountain range between Aquilonia and Nemedia is usually seen on successive Hyborian maps, but not the western mountains of Cimmeria. Should they be included in the "Hyborian Kingdoms" map, since we know they exist and their rough location, even though we don't know the precise extent? Or should they go in the wider "Hyborian World" map? 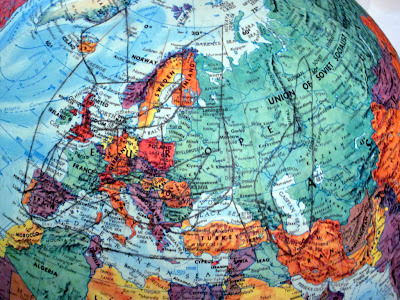 The beauty of this map is that the game world is clearly and strongly defined, while the neighbouring nations are a sort of ghostly borderland. 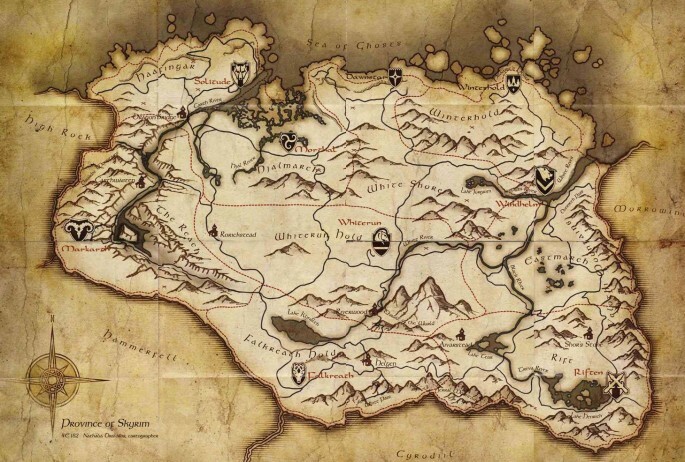 This could work magnificently for a variation on Howard's map: the Hyborian Nations and surrounding barbarian lands are defined like Skyrim, while the likes of Stygia, Turan, Shem and the Eastern Desert are defined only as the hazy masses like Hammerfell, High Rock, Cyrodiil and Morrowind are in the above map. This was also used in the map of Cyrodiil in Oblivion, and the ambitious Tamriel Rebuilt mod that aims to create the entire world of The Elder Scrolls. Imagine Aquilonia as a stylized lion, Nemedia as a dragon, Stygia a coiled snake, the Pictish Wilderness a mass of skulls, snakes, sabretooths and apes, Cimmeria a screaming horde of panthers and wolves. Perhaps not as cartoonish as Thompson's idea, but done in a more Medievalist style. A fun idea, if nothing else. Maybe keeping it simple is as good an approach as any. It also reminds me that cartographic elements like a compass rose and bar scale would be useful, if I do a Hyborian map without Europe superimposed. Also, a few details like a cartouche and map legend would be nice. I've changed my mind on a number of issues since drawing this map: for one, I think the Border Mountains are far more extensive in the north upon re-reading "The Hour of the Dragon." I also remembered that the nature of Hyborian Age cataclysms means areas which don't correspond exactly could be warped and shaped over the years. 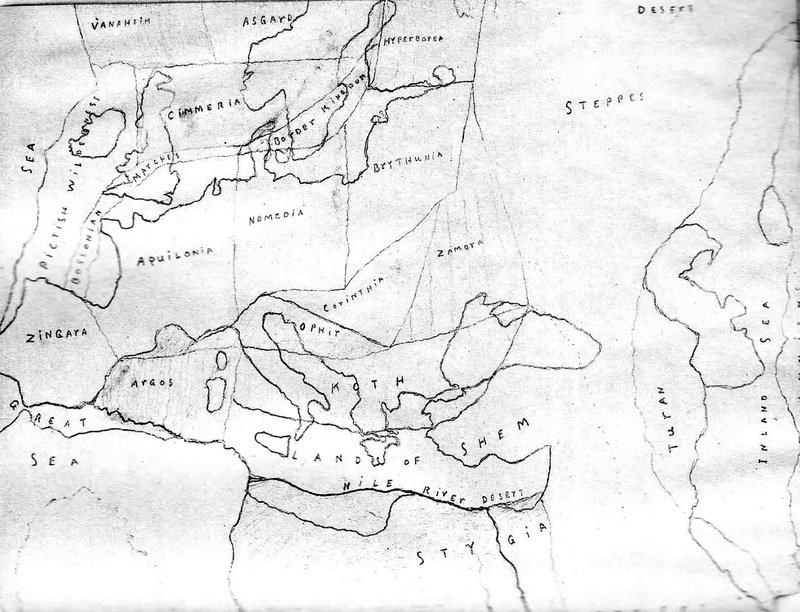 A perfect example of this could be the Kothian Escarpment: the Appenines of Italy, Pindus of Greece, Rhodopes of Bulgaria, Balkan mountains and north/west Black Sea Coast could, in Conan's time, have formed a great upland mass with an escarpment corresponding roughly to Koth's border, as in the stories. I'm probably going to make the distinction between hills and mountains more pronounced, such as the hills of Shem/Koth/Hyperborea and so forth. Don't want to be confusing. Rivers are another matter: I've never been entirely satisfied with current maps, but I can't put my finger on why, and the lack of major bodies of water somewhat perplexed me. Perhaps it's just my Euro-centric viewpoint: most other continents don't have nearly the coastal and archipelagic variety of Europe, so it shouldn't seem at all strange to conceive the Hyborian Age as essentially a big lump of a landmass. Colour might be a good idea, to fully convey the breadth of climate within the age. Whatever happens, I'm not going to be using any of the pre-existing maps. Much as I appreciate their artistry and aesthetics, most of them are just wrong: the Zaporoska river on the wrong side of the Vilayet, Black Kingdoms in a neat little row, bloated Aquilonia and Khitai and shrunken Nemedia and Stygia, Kosala west instead of east of Vendhya, not to mention pastichery like Drujistan, Venjipur and Pathenia. Howard provided more than enough. *Originally I mentioned a "mysterious" third map which I had apparently never beheld with mine eyes, but I can only assume some sort of swiss-cheesery was going on in my brain, because I had in fact seen this third map tons of times - as has anyone who's bought the Del Rey edition containing it. This is absent-mindedness bordering on bad comedy. I was under the strange assumption that the two maps in the Del Reys were "1a and 1b," with the erratic second map being map 2, leaving a third/fourth unknown map. Why did I think 1a and 1b? Maybe I was getting mixed up with all the different a's and b's among Howard's drafts, or some such. Perhaps I misinterpreted Scotty's discussion of the third map to mean chronologically, rather than being draft 2. Very weird, and I'm indebted to Tex for shaking the cobwebs out of my head. One thing I would like to see would be a detailed map based on REH's sketches and writings. Cities, rivers, mountains etc. placed according to the "clues" found in the texts. One could even perhaps expand a little Howard's maps but taking it as far as Khitai or even Vendhya is stretching it. Too much artistic freedom and/or speculation would ruin the purpose of the map. Oh. AND a mysterious third map! I've never heard of this. Now I want to see it. Nevermind about the third map if it is the same found in the links to the Darkstorm Files. I was familiar with all of those. Everyone is doing their part. Awesome, looking forward to your map, in any of the styles mentioned. Thank you for the links to Dale Rippke's maps, I didn't know about them, and they were very interesting, being of the non-western regions. I still don't think too much detail in those areas is good, but his take on them was great. Very interesting post. You may have already said this, but for this work what are you thinking in the way of illustrations? Lots of the things you mention sound cool, and would perhaps work better as insets to the text rather than "full-spread" maps. On the other hand, perhaps with enough material you could even have a companion volume, "The Hyborian Atlas". At a minimum, though, you'd probably want to include at least one Howard-drawn map, and another "main" map that has, to whatever degree, been cleaned up and rationalized. If you can somehow suggest the relationship between the Hyborian nations and the modern ones, so much the better. 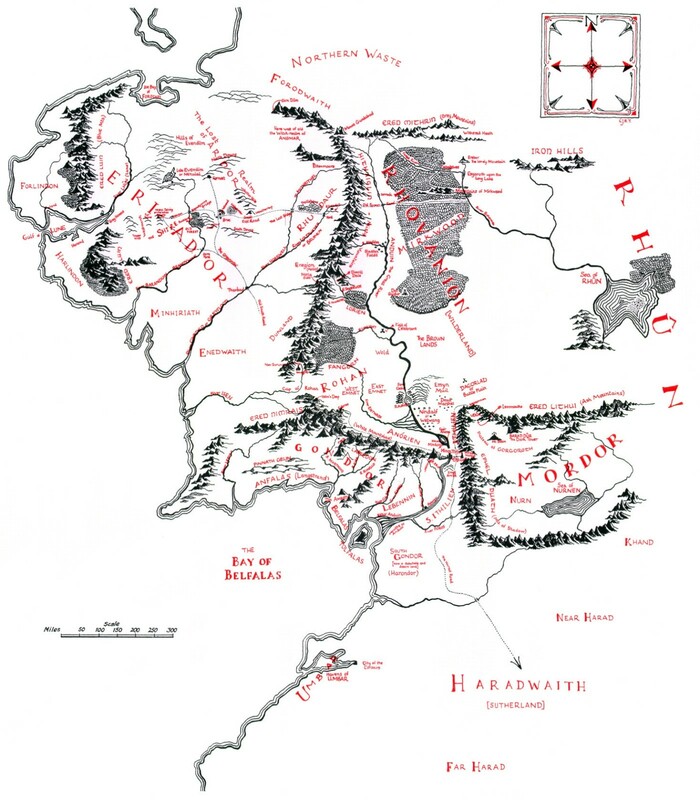 On that subject, I've seen some great work doing the same thing with Middle-Earth - one of my favorites is at http://strangemaps.files.wordpress.com/2007/06/middle-earth.jpg (warning: it's pretty big). Incidentally, that WWI caricature map is specifically a map for Scott Westerfield's Steampunk WWI "Leviathan" trilogy. I haven't read the last one yet, but the first two were excellent examples of the Young-Adult-Alternate-History-Steampunk genre. The Dale Ripke material is excellent. I hadn't encountered those maps before, and Ripke's interpretations are certainly far more satisfying than any extent "full" Hyborian-age maps I've come across. The Mongoose map of "Hyboria" is just littered with errors, including the wonky depiction of Stygia and southward from the Miller map. It's kind of annoying that the "official" map just doesn't match up with even a cursory reading of the stories when you look to the south; how could no one bother to rectify this? It also helps to remember that despite Howard's use of historical names, the regions rarely mapped to their present ones. Rippke's placement of Khitai was one of those "of course!" moments for me, because I would have placed it in northern/western China (the actual location of Khitan Liao and Kara Khitai, respectively), when geographically, Ripke's map makes much more sense. Same goes for Iranistan, which isn't *geographically* Persia, and I feel foolish for thinking it was (culturally and linguistically, of course, Iransitan *does* appear to be Persia). I also recommend the recent map made by Amra the Lion over at the conan.com forums a year ago. This is the best map I have seen: wonderfully coloured and contains only Howard material. excellent article, by the way my memory is not specially good, the correspondence between the mountains in the hyborian age and modern countries and geographical accidents were mention in the Hyborian age essay? If you can somehow suggest the relationship between the Hyborian nations and the modern ones, so much the better. could it be interesting an ethnic map of the hyborian age? and other ethnic map but related to modern ethnicities? for instance cimmerians as proto-celtics, Turan and Hyrkania as predecessors of the stepparian peoples like huns, tartars, turks... Brythunia as the origin of the britons although geographically is Poland!!! Same goes for Iranistan, which isn't *geographically* Persia, and I feel foolish for thinking it was (culturally and linguistically, of course, Iransitan *does* appear to be Persia). and what about a list of the royal dinasties in the hyborian kingdoms, and a weather map (I think you have mention it) and a demographic map, great migrations map, a battle map with the main wars, a linguistic map, an economical and technological development map...??? 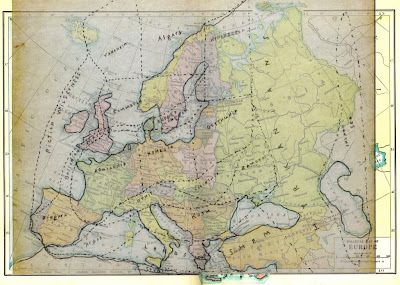 I think an aesthetically pleasing "update" of Howard's map, with Howard's names for lands, in a large resolution, accompanied by a smaller one in the corner where the Hyborian map is superimposed on Europe, might be the best route. It would look great if it was designed as a "realistic" map from past centuries, i.e. a woodcut or engraving look, black and white but very detailed. Small mountains, kingdoms, animals, swords etc. There's a wealth of historical maps for inspiration. All the "pastiche" maps are dead wrong. They use certain evident reference points such as the Vilayet and then turn the map accordingly until certain regions coincide. That is STUPID, and all these pasticheurs are simply wrong. "The ocean flowed around the mountains of western Cimmeria to form the North Sea; these mountains became the islands later known as England, Scotland and Ireland, and the waves rolled over what had been the Pictish wilderness and the Bossonian marches. " 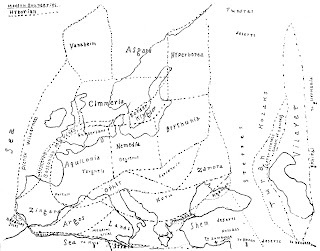 But what strikes me is that the maps we see have Western Cimmeria containing a large part of actual Norway, a large middle section of Sweden and even Denmark and a bit of Finland. Modern IRELAND isn't even in Cimmeria??? 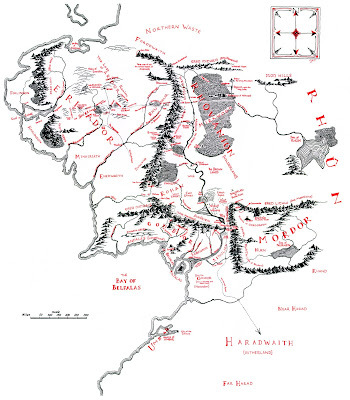 Howard said clearly that western Cimmeria became the british Isle, he didn't say it became something like eastern scotland + northern britain and that's all folks. If Ireland isn't in Cimmeria and if Norway + Sweden are instead, the pasticheurs might as well jump in the lake, all is lost. 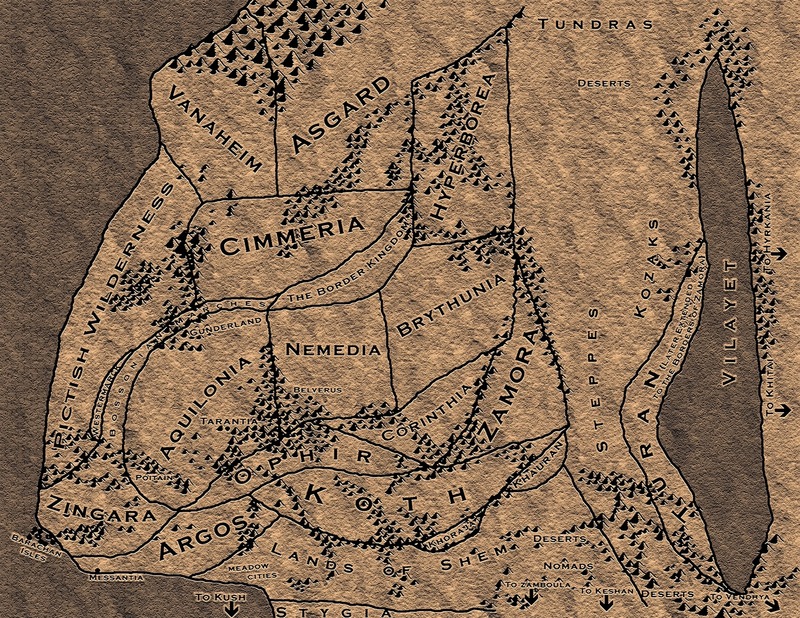 The dickheads who put Cimmeria was where modern Germany is, should jump in the lake as well, they've never read any Howard yarn, let alone the Hyborian Age essay, or simply they're yapping all this nonsense for marketing reasons or because they follow a certain pasticheur's ideas, not to say who it is, we all know the infamous traitor/impostor. I do not understand why we have a 1932 map having Cimmeria not comprising Ireland, Ireland itself being inside the Pictish wilderness area, when the Hyborian Age essay says the mountains of western Cimmeria became Ireland, Scotland and England, and that the pictish wilderness sank completely (thus Ireland could not be where the pictish wilderness was). Is this 1932 map genuine? Are all "howard" maps 100% genuine? Is there a possibility of falsification by his biographers & "posthumous" co-authors? Or did Howard change simply his mind and relocated (some of) the Hyborian Age countries? 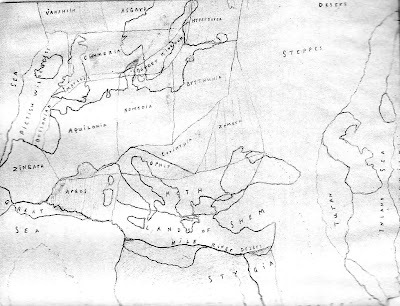 Some of these problems -as seen on the Del Rey rendered superimposed Hyborian/actual Europe maps could be partially solved if we consider that once slightly enlarged or dilatated, Howard's Hyborian Age map would then have Koth superimposing itself over Anatolia and thus the ancient Hittite kingdom,instead of having "Shem" over modern day Turkey, and we would have Ireland in Cimmeria too, and so on. Shem should start at the south/south-western limits of Anatolia , modern day northern Syria and Iraq. Ophir would then coincide more with modern day Greece as well, which would be more logical. I really do not like the "Del Rey superimposed job". It's extremely imprecise and I have the impression of a reduced hyborian Age map simply stuck in a hurry over a quickly drawn europe/middle east map.